Closet Size: Pretty simple and straight forward right? The larger the closet, the higher the cost. Generally, this is the case; but, we have built 2 feet by 8 feet guest reach-in closets that are more expensive than 12 feet by 12 feet master walk-In closets. There is more to the story than simply size. Construction Material: At Closet Tec we offer our clients a variety of closet construction materials. On the low end of the cost spectrum we use 3/4 inch furniture grade particleboard commonly referred to as Melamine. It comes in variety of solid and wood grain colors, is structurally sound and is by far the most popular (primarily because of cost) with our clients. We also offer wood veneer in a number of wood species (soft maple, oak, cherry, etc.) that can be custom stained to match existing furniture. Finally, if you really want to spend serious dollars you can use bamboo. Linear and Square Footage of Material: The pricing models at Closet Tec (and most other closet companies I suspect) are directly driven by the linear and square footage of the preferred building material. If you are similar to Imelda Marcos and have tons of shoes you are going to need lots of shoe shelving. Believe it or not, I have turned what was once a bedroom in homes into a closet where the closet to what was once a bedroom is now used exclusively for shoes. Yes, it’s called a shoe closet. Remember when I said I’ve done closets for over $20,000.00! Finish: The color and/or finish of the building material will be a cost factor. Melamine comes in a variety of solid and wood grain colors, some more expensive than others. When using wood the staining process can be a one step process of simply applying a stain. Or, it can be as complicated as applying a stain, glazing the product after staining and finishing up with a “fly-specking” process. Obviously, 3-step staining is more expensive. Drawers and Doors: The more drawers and doors you have in the closet the more expensive the closet. 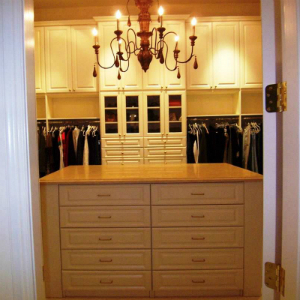 Small closets filled top to bottom with doors and drawers can cost more than much larger closet with only hang. Like the construction materials detailed above, the cost of the doors and drawers will vary as well. One can choose five part solid wood drawer/doors that may be painted/stained or opt for a one part MDF (Medium Density Fiber) Thermofoil drawer/door. To further complicate things, the cost of both of those options varies depending upon the inner and outer edge profile (i.e. style) of the door/drawer. Styles like Shaker are more difficult to manufacturer and, as a result, cost more. Accent Trims: Crown molding, cabinet backing, scribe molding on shelving, toe kicks with baseboard moldings are all options that enhance the appearance of a closet. Of course, they add cost to the final product. Accessories: Jewelry trays, clothing hampers, wire baskets, center islands, glass doors, ironing boards, garment valets, wall safes, lighting, robe hooks, mirrors, tie and belt racks. There is no shortage of bells and whistles that can be incorporated in a closet. Now, if you call Closet Tec and ask the question “How much is my closet going to cost” and my response appears to be somewhat vague, now you know why. There are lots of things to consider. If you truly want to know what it’s going to cost to tackle that closet upgrade simply schedule a design consultation with one of our professional designers. After they measure and determine your specific requirements, they will provide you with a project cost. If you still insist on having a price quote during that initial phone conversation, there is one that I can provide with 100% certainty. That would be the cost of the design consultation. It’s free! Designer with Closet Tec Inc.